Today's project will be this simple beginner bookshelf. 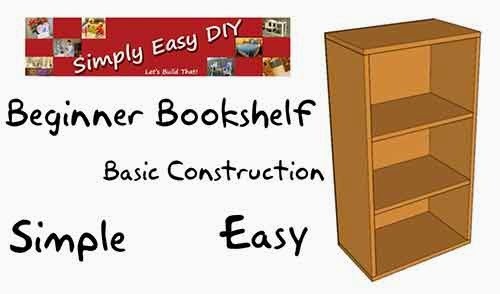 2 - Bookshelf Sides @ 36" x 10.5"
2 - Top & Bottom Pieces @ 20" x 10.5"
2 - Book Shelves @ 18.5" x 10.5"
1 - Back Panel @ 37.5" x 20"
Hi and welcome to Simply Easy DIY.com. Today's project will be this simple beginner bookshelf. This is going to be a very basic project build. Even if you have never built a thing in your life, you'll still be able to build this. Just a few basic tools will do. 4. A pocket hole jig. 6. A few one and a quarter inch screws. 7. Some 3/4 inch brad nails. 8. hammer or if you have a brad nailer use that. Lets get started. First, cut the sides to length. You have a few options available depending on your comfort level. I recommend using 1x4s and gluing them side by side. This is known as edge gluing. An edge glued board tends to be a more stable board. Meaning it will not warp as easily as simply using a single wider board such as a 1x10. So you've got some work to do if you decide to go the way of the edge glued board. Cut all the pieces to length and then glue three together to get your width. Do that for all four outside pieces. Next, attach the top and bottom to the sides. Don't worry this part's easy. Drill some pocket holes on both ends of both sides. Three for each end should be good. I like to apply glue between the pieces before securing with screws. Alright, so now we have the four sides of our bookshelf but right now its not going to be very good at resisting torsion. It needs a back panel to give it some rigidity. Lay the carcass down on what will be its front, apply some glue along the back edge and tack in place with brad nails. Both big box home improvement stores can cut this piece to size for you if you don't feel comfortable doing it yourself. Now all we have to do is measure, mark and drill for shelf pins and add the shelves. Their you have it, a basic beginners DIY Bookshelf for not a lot of money. Apply a coat of paint, maybe a stencil or two and I promise it will look a lot more expensive than it really was. Plus you'll have the satisfaction of knowing you built it yourself. Next time I'll show you how changing just a few small details can improve its design without adding a lot of complexity. Find me on Facebook, Google plus, Pinterest or sign up for email updates whenever new project ideas are ready to go! Have fun and never stop building.